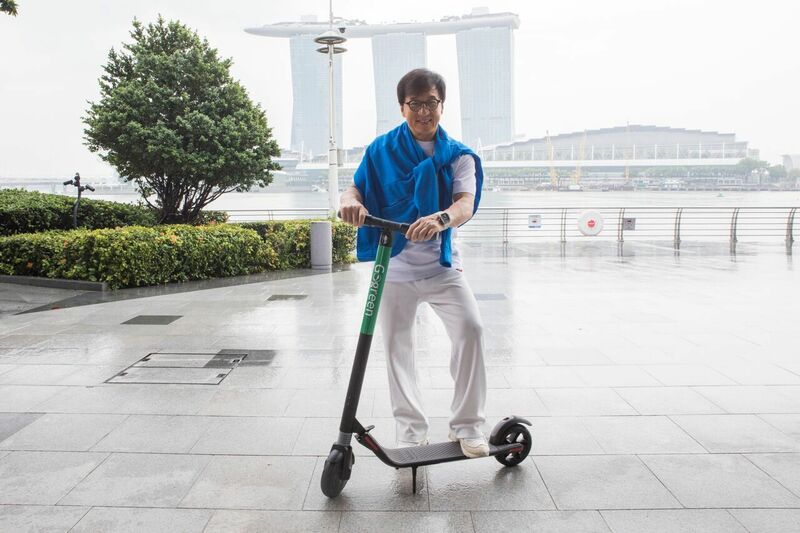 International superstar Jackie Chan graced the Fullerton waterfront this past weekend, as Gogreen Holdings launched its pilot dockless scooter sharing program. Chan, who is also a Gogreen Holdings shareholder, said that it "is a great privilege for me to launch the first fleet of Gogreen dockless electric scooters here in Singapore. This initiative not only promotes green technology—something I strongly believe in—but the versatility of the Gogreen dockless scooters also allows travellers to discover the city at their own pace..."
The Gogreen scooters are adapted from the Ninebot by Segway KickScooter, which meets the requirements for personal mobility devides set forth by the Land Transport Authority. The launch of these Gogreen scooters represent the first phase of a wider scooter sharing programme, which is scheduled for Q3 2018.